Bhubaneswar: The Corporation meeting of the Bhubaneswar Municipal Corporation (BMC) today decided to penalise and collect a fine of Rs 50 per offence, if a person is found defecating in the open, by the local Ward Sanitation Committee or the Self-Help Groups. This step will work as a catalyst to make the city open defecation free (ODF) and the legislation by the urban local body is also a prerequisite in this regard, for the ODF tag. BMC Mayor Ananta Narayan Jena also announced that in order to make people aware about the new legislation on collection of penalty, awareness camps will also be organised across the city to keep the city clean. The corporation meeting was attended by Odia Language, Literature, Culture and Tourism Minister Ashok Chandra Panda, BMC Mayor Ananta Narayan Jena, Deputy Mayor K. Shanti, Municipal Commissioner Dr. Krishan Kumar, Additional Commissioner Subham Saxena and senior officials from BMC, Bhubaneswar Smart City Limited, BDA, PHEO, PWD and other line departments. While the proposal for collection of fine from persons defecating in the open was unanimously passed by the Corporation, the Corporators also expressed their strong view against the mushrooming growth of Kalyan Mandaps (community halls) across the city, which ultimately create traffic jam and additional burden on the civic body in lifting the solid waste, they generate by holding various functions and social gatherings. The Corporation also decided to make a survey of all Kalyan Mandaps across the State Capital through the Planning Wing of BMC in association with all the Zonal Deputy Commissioners, Corporators and officials. The nature of plan approval given to a Kalyan Mandap (whether residential or commercial) and the violations made through parking and encroachment irregularities would be taken into consideration. Seven prominent water bodies inside BMC boundary will be restored with an investment plan of Rs 20 crore. While a DPR has already been prepared by an agency Multi Mantach, Odisha Urban Infrastructure Development Fund (OUIDF) will extend financial assistance in this regard. The project will be funded through grant, loan and share from BMC in the cost sharing pattern of 45:45:10. The water bodies to be covered under this restoration or conservation plan will include: Ananta Vasudev Purohit Pond Ward No. 19, Ghagudi Pond Ward No. 23, Jagamara Barabari Pond Ward No. 63, Jhara Pokhari Ward No. 62, Namrakani Pond Ward No. 65, Taria Pond Ward No. 23 and Nayapalli Haja Ward No. 37. Drain de-silting and cleaning also featured in the discussion today. “The rest of nearly 15 to 20 percent will be finished very soon as we have asked our drainage team to work on war footing and make the drains and drainage channels free from any type of obstruction,’’ said the Mayor. Odia Language, Literature, Culture and Tourism Minister Ashok Chandra Panda, asked the corporators to furnish the list of temples in their locality so that Rs 5 lakh per monument would be granted for their upkeep. He, however, clarified that the temples should be under public use and do not belong to private ownership. Municipal Commissioner Dr. Krishan Kumar in his speech briefed about the progress of various projects under the Smart City Proposal. He explained at length about the Bhubaneswar Operations Centre, which would be the central command control centre for all city-based operations. He also spoke about the revamp in the pan-city public transport scenario, which would see radical changes before the coming World Cup Hockey. 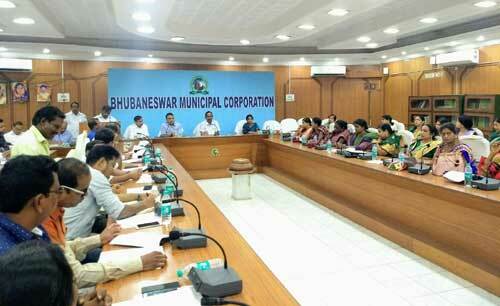 Before the Corporation meeting BMC Standing Committee Chairman Election was held today in the conference hall. Following members were elected to head nine different Standing Committees. Seikh Nizamuddin: Taxation, Finance and Accounts Standing Committee. Biranchi Narayan Mohasupkar: Public Health, Electric Supply, Water Supply, Drainage and Environment Standing Committee. Amaresh Jena: Public Works Standing Committee. Naba Kishore Behera: Planning and Development Standing Committee. Pranab Kishore Swain: Education Recreation and Culture Standing Committee. Sanjaya Kumar Sethy: Licence and Appeals Standing Committee. Samir Pradhan: Corporation Establishment Standing Committee. Kumarendra Mohapatra: Slum Resettlement Standing Committee.